EVERYTHING is more expensive on the turbo, everything. Definitely drive them both. They are very different. Ultimately it's going to come down to your personal preference. This is a debate I had with myself prior to purchasing the turbo. Even after I purchased the 996TT I made a deal to trade it for a 997S. I didn't go through with the exchange because I really wanted the turbo that is why I bought it in the first place. My two cents on the decision is the turbo is the daddy! The S is a special car, but you'll never have to "apologize" for have the turbo, any model. You will never be able to replace the "press you in the seat feeling" with anything else. Drive them both, then do it again ... think it over, then make a decision. You'd be happy either way. Tires might actually cost more for the 997CS since it will have factory 19s whereas the 996TT would have factory 18s. So, not everything needs to cost more! I was surprised at the low torque on the 997, I suspect this is really where the difference will be felt. I'll report my findings. I would recommend considering your ambitions for the car too. Assuming you want to leave the car factory stock, I could see a lot stronger case overall for the 997CS (power delivery, nicer interior, round headlights, more modern features, etc.). However, keep in mind that if you want to modify the car for more power that the 996TT is in a league of his own, with even just a simple reflash/exhaust able to give you 100 additonal horsepower and torque. You could spend far more only to get much less gains from the 997CS...totally different league. Something to think about at any rate. I'm sure you'll be impressed with both cars. The turbo simply for the GT1 block, it is legendary and damn near bulletproof. If you have ANY hint that you might want to mod then definitely the turbo, otherwise the wide body C4S wouldn't be bad either. Would depreciation on the 996TT be a little better than the 997 since it has less miles and more years have passed? If so, that might be something to consider. 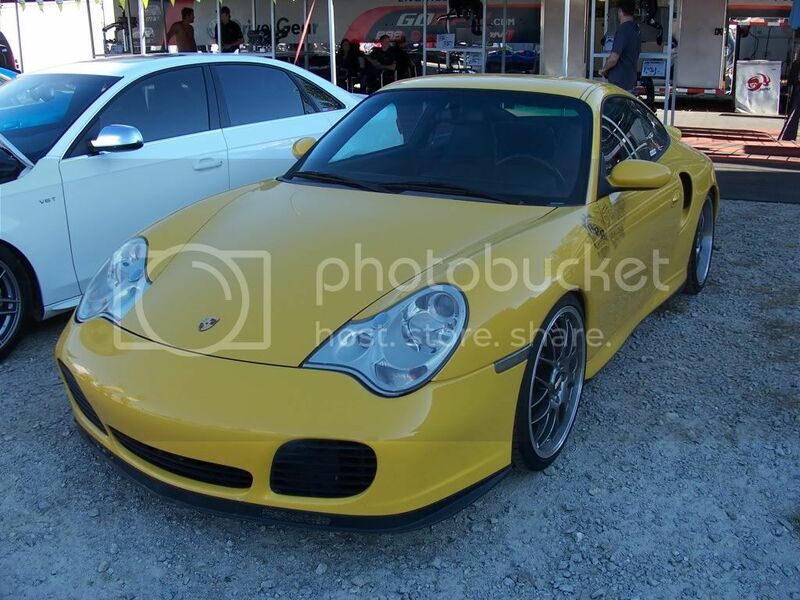 I suppose you could also argue that you get the wide body with the 996TT and narrow with the 997C2S. To me the widebody (C4S) isn't worth the weight disadvantage unless you are going turbo. I was at Petite LeMans this weekend and spotted this beaut. Not sure I need to go through the process of driving the 997 C2S. I just got back from my 996TT drive, WOW! WOW! WOW! Not much else to say, what an awesome machine. The question is why would I need to give it more power than it already has (silly question I know)? GOD that was a fun drive! Bone stock except for front strut brace and 19s. I'd still take that test drive if you have the means and time. If nothing else, it should help to cement your decision. I'm sure there are things about the 997CS which you will like, and you should feel comfortable with your decision overall and not have any regrets. Had the same decision 2 years ago. Went with the 996 TT Cab and have done significant mods since. Full Evom, BBS wheels, lowered etc etc. Never a doubt in my mind this was the route to go and I actually much prefer the headlight treatment on the 996 TT to the 997. Car has been extremely reliable. Original MSRP on my car was $146,200. And that was 2002! Pennies on the dollar gets you an amazing machine. And, mine still is under a full Porsche warranty. The turbo is intoxicating. Which oil collector pan for DIY oil changes?